It may seem that the weeks and months after giving birth are the most tiring of you life and it may be all you can do to find a clean shirt much less get out for a jog, but keeping fit after the birth is necessary not just for your physical health but for your mental health as well. Not only will you feel better and look better if you commit to keeping fit after the birth, but you’ll be setting in motion a pattern of healthy living that will benefit your whole family. “Mummy and Me” (or “Daddy and Me”) classes or videos that allow you to move with your child. Blasting some music and dancing about for a half an hour or so. Cleaning up! A high-energy weekly clean will leave you feeling lighter in more ways than one. Incorporating a daily walk into your routine. Engaging in mother/father and child swim classes. Investing in a few free weights that you can use whenever you find a few pockets of spare time. Asking a friend or relative to babysit a few times a week while you can get to the gym or pool. Eat at least five fruits and vegetables per day. Focus on whole grains rather than refined/white bread, pasta and rice products. Throw away the pre-packaged snacks. Remember, eating an apple is just as quick and easy. Eat when you are hungry, and if you are breastfeeding this might be often. Don’t deny yourself or you’ll risk a calorie/sugar/salt-laden binge later. Prepare whole meals. It may be tempting to rely on takeaways and sandwiches, but getting your family into the routine of home-cooked meals, and family mealtime, will bring rewards for years to come. When your body feels good, your mind usually does too. Stay positive about keeping fit after birth – even if it’s just a change to a “Yes I Can!” philosophy from a “No I Can’t!” philosophy. 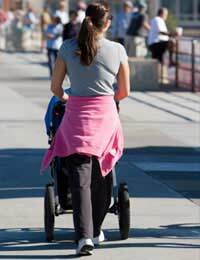 Remember, keeping fit is not solely about losing your baby weight. No new mother should feel pressured into losing weight or fitting into old clothes, so if you are feeling this way then actively change your mindset to revelling in the power of your body.